Superior is excited to introduce the Trellis all season medium weight down alternative comforter bedding set. This contemporary, modern style bed set will complement any room with its modern and elegant double trellis pattern on the comforter and pillow shams alike. Ever popular brushed microfiber material provides a smooth, soft look. The down alternative filling is a perfect alternative to duck down or goose down as it is hypoallergenic and offered at an affordable price. The soft, breathable nature and weight of this fabulous bed covering will keep you warm and cozy in the winter and cool in the summer for year-round comfort. Sleek and sharp, double trellis pattern is charming, sophisticated and elegant on the comforter and pillow shams alike. The color is so vivid. Beautiful on the bed. Very luxurious. The only thing that was not satisfactory is the fact that the shams are a notable size larger than the standard size pillow, so it would also probably accommodate an overfilled pillow perfectly. I am well pleased though. I LOVE this comforter set, the colors are beautiful and is so comfortable. I would highlh recommend and definitely would purchase it again! I got this for my new apartment with my boyfriend. I needed something that we both liked. This comforter's pattern and color was something we both enjoyed. It's really comfortable and warm, too. The only downside is that it's dry clean only. 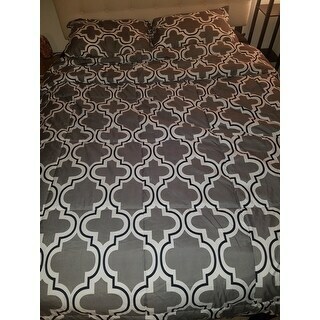 This comforter is beautiful and comfortable! I have had some bad luck with comforters lately so I will need to see how this comforter holds up over time but as of right now I am happy with it. This comforter set was one of the best gifts I bought for my niece! She loves the pattern, softness, and warmth that it brings her!! She takes it everywhere she goes when she travels!! 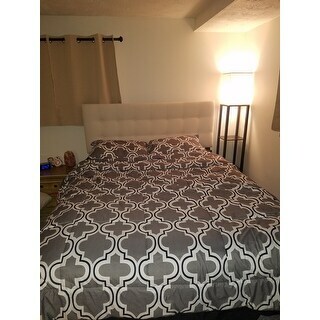 Great comforter for the price. The color is bold. The fabric is lightweight, but heavy enough to lay nicely on the bed and feel comfy underneath. My only crticism is that the threads have a cheap, manufactured look, but that can be expected at this price point. I am very satisfied with this purchase . I love it, everything in my room is solid white with a nice wood trim so this adds the life I need. Seems of good quality too, not as thick as other down alternatives. It's light and airy, perfect for Florida weather. Mi cali king bed is pimping with this. Love the color and the fabric. Not cotton, which I didn't pick up on until it got here, but for the price for a teenager's room it's fine. Dark navy with grey and white details. So soft and nice. Fits perfectly on our room theme. The material is good too. Loved it! The colors were exactly as pictured online. The quality was better than expected and is holding up very well. It also washes well and doesn't bunch up. I would definitely recommend it. I like the colors! Do you have curtains to match the comforter set? Inexpensive, bold color. Should be good to have as a back up comforter set. "Are there matching curtains for this set?" No,there are no matching curtains for this.